To expect the possibility of giant cell tumor of bone even in skeletally immature patients. Case Report | Volume 5 | Issue 4 | JOCR Oct-Dec 2015 | Page 57-60| Vipin Sharma, Seema Sharma, Kewal A Mistry, Bhanu Awasthi, Lucky Verma, Uttam Singh. DOI: 10.13107/jocr.2250-0685.347 . Department of Orthopedics, Dr RPGMCH, HP. India. Department of Pediatrics, Dr RPGMCH, HP. India. Department of Radiodiagnosis, Dr RPGMCH, HP. India. Introduction: Giant cell tumors of skeleton are very rare in pediatric and adolescent population. Here we report two cases- one a fifteen year old child with swelling distal humerus and another a case of a thirteen year old child with pain and swelling proximal tibia. Case Report: A fifteen year old child presented to department of orthopedics of our institute with complaint of difficulty in moving upper limb and swelling distal humerus. Another patient who was a 13 years old male had painful ambulation and swelling in upper tibia. MRI followed by core needle biopsy was done in both the patients confirming the mass to be giant cell tumor which is quite rare in this age group. First patient was managed by wide excision and total elbow replacement and second one by curettage, cementation and augmentation with plate-screw construct. Conclusion: Giant cell tumour of skeleton is highly uncommon in pediatric age group. It should be considered as one of the differential diagnosis of epiphyseo metaphyseal lesions in pediatric population in spite of its rarity. Keywords: Giant cell tumor of bone, curettage, recurrence. Giant cell tumor (GCT) of bone is one of the most common bone tumors of adults encountered by an orthopedic surgeon and radiologist alike. It is a benign aggressive tumor of skeletally mature individuals with incidence peaking in third decade of life . In skeletally immature individuals giant cell tumour is extremely rare (1.8% to 7.5%) with slight female preponderance and epi-metaphyseal location . We hereby report two cases of giant cell tumor in pediatric age group, one of which was managed by wide excision and total elbow replacement and another by extended curettage- cementation and plate-screw augmentation followed by good functional outcome in both the patients. In our orthopaedic oncology clinic we have come across two pediatric patients having giant cell tumor of bone in last two years. First patient was a 15 years old male child presenting to us with history of pain, swelling in right distal humerus for last three months. Second patient was thirteen years old male who came with a history of swelling proximal tibia and painful ambulation for last four months. Their detailed clinicopathological profile is given in Table 1. There was no antecedent history of trauma or systemic disease. Radiologically features of epiphyseometaphyseal lesion, thinned out cortices, physeal destruction and wide zone of transition were noted more so in first patient. Keeping in view age of patients and radiological appearance differential diagnosis- of chondroblastoma, brown tumor, aneurysmal bone cyst and giant cell tumor were kept. Biochemical profile revealed normal serum alkaline phosphatase levels thereby excluding hyperparathyroidism. MRI in both patients was suggestive of GCT which was confirmed by histopathology examination. Both patients had Campanacci grade III giant cell lesions and were managed surgically. As Case 1 had cortical breach in multiple planes, large soft tissue component, total physeal destruction, large area of subchondral bone involvement, hence wide resection with total elbow replacement was planned [Fig.1]. Case 2 had minimal cortical breach and a small soft tissue component. Hence this patient was managed by extended curettage, cementation and plate-screw construct augmentation. 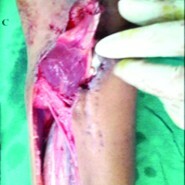 There was wound dehiscence at six weeks in this patient which was managed by gasrtrocnemius flap [Fig.3]. Both the patients are free of recurrence at one year follow up. Identical to their adult counterpart, the most common site of pediatric giant cell tumors is around the knee ( lower end of the femur and the upper end of the tibia) followed by distal radius and proximal humerus , distal humerus being a rare site . Out of two patients presented here the first one had giant cell tumor of right distal humerus and the second one in left proximal tibia . Giant cell tumors of bone (GCT) are primarily metaphyseal lesions that reach their typical epimetaphyseal location after growth plate closure  . Open physis is known to restrict GCT to an almost exclusively metaphyseal location , while according to some authors an open physis does not prevent GCT from penetrating the physis to become epiphyseometaphyseal . In present study too both patients had open physis, still the lesion was epiphysiometaphyseal suggesting a more aggressive behaviour of lesion . The principles of management in pediatric giant cell tumor range from local control without compromising joint function and preservation of physis as much as possible to wide resection and reconstruction, the latter being used only in select group of patients. Local control without compromising joint function is achieved with thorough curettage of the lesion aided with a burr (extended curettage). Campanacci grade I, II and even III lesions especially with no joint invasion, less than 50% metaphyseal destruction and uniplanar soft tissue mass are treated by this modality . Many adjuvants and techniques of reconstruction after curettage have been described in literature, but adequate removal of the tumor with extended curettage is a more important predictive factor for surgical outcome rather than the use of adjuvants . Autograft, allograft, tantalum, synthetic bone substitutes like calcium phosphate as well as bone cement have been used for filling the cavity after curettage. Auto and allografts have drawbacks like limited availability, collapse and infection while use of tantalum with allograft and bone marrow though promising is limited by its high cost . Bone cement (PMMA) is a cheaper and much popular alternative. It allows early weight bearing, physical rehabilitation and return to activity by maintaining normal anatomy and providing immediate stability. It fills irregular cavities and moulds around implants. Recurrence can be detected earlier when bone cement is used as cavity fillng agent. But frequency of postoperative fractures following extended curettage and cementation is a problem which needs consideration. A study reported fifty-two patients with benign giant-cell tumors treated with extended curettage, cryosurgery with liquid nitrogen and cementation. Although the rate of tumor recurrence was low, approximately 25% of the patients had postoperative fractures . Metal augments (screws, steinmenn pins and plate-screw constructs) have been advocated to address this problem of postoperative fractures. They provide immediate stability, early weight bearing and postoperative fracture prevention , resulting in better functional outcome and improved musculoskeletal tumor society score ( MSTSS) . Proximal tibial T Plate and screw construct was used in our study in the second patient as metal augment . Wide resection and reconstruction is opted only in select group of patients with Campanacci grade III lesions with joint invasion, multiplanar soft tissue component and when large area of subchondral bone is involved by the tumor  . Under in such conditions bone salvagibility by intralesional methods is bound to result in a severe mechanical compromise thereby impairing restoration of skeletal integrity and leading to a severe functional compromise . Biological options like hemi-articular and total elbow allografts have been used for reconstruction of the defects following distal humerus tumor resection, but the complication rates are high, hence wide resection and total elbow arthroplasty enables good functional outcome and lower risk for recurrence .Biological options like reconstruction with allografts are reserved as salvage procedures following failed total elbow arthroplasty. Both our patients were Campanacci grade III lesions with first patient having thinned out cortices , cortical breach , total subchondral bone involvement and a large soft tissue component . Hence wide resection and total elbow replacement was chosen in this patient while second patient had relatively contained lesion , partial epiphysiometaphyseal involvement , minimal uniplanar anteromedial soft tissue mass and hence was treated with extended curettage, cementation and plate-screw construct augmentation. Physeal penetration and destruction by aggressive GCT is bound to lead to angular deformities and growth related problems . In adolescents this is not common as residual growth left is very less. Metastasis usually to lung and malignant transformation are other lesser known complications. The frequency of pulmonary metastases in GCT has ranged from 1% to 6% . Local recurrence has been noted to increase risk of lung metastasis up to as high as six fold especially in grade III lesions  . In the event of lung function compromise due to metastasis , metatatectomy or pulmonary wedge resection may be required. Recurrence is quite common due to the difficulty in achieving complete clearance because of breached anatomical boundaries by GCT along with extension into the adjacent soft tissue. This can be managed by further curettage and cementing , with a minor risk of increased morbidity . Although GCT is a rare entity in pediatric age group , it mirrors the behaviour of its adult counterparts in terms of location , treatment, recurrence and course of the disease . It must be considered as one of the possible differential diagnosis of epiphyseometaphyseal lesions in pediatric and adolescent population in spite of its rarity . Clinical examination, proper imaging including X Rays, MRI followed by histopathological confirmation is necessary to arrive at accurate diagnosis in pediatric giant cell tumor of bone. Serum alkaline phosphatase is an important biochemical marker as its normal levels rule out brown tumor of hyperparathyroidism. Modality of surgical management, extended curettage or wide resection is based on parameters like cortical breach, large soft tissue component and extent of subchondral bone involvement. 1. Turcotte RE. Giant cell tumor of bone. Orthop Clin North Am.2006;37(1) : 35-51. 2. Puri A, Sharma V, Gulia A, Sharma S, Verma AK. Management of Giant Cell Tumour Radius in a Three Year old Child with an Improvised Technique. JCDR 2014 Dec ; 8(12):QD04-6. 3. Sait SA, Nithyanath M, Cherian VM. Giant cell tumour of the distal humerus treated with elbow arthroplasty: a case report. Int J Case Rep Images 2012;3:37–40. 4. Rietveld LA, Mulder JD, Brûtel de la Rivière G, van Rijssel TG. Giant cell tumour: metaphyseal or epiphyseal origin? Diagn Imaging. 1981;50(6):289-93. 5. Jundt G. Pathologic – anatomic characteristics of benign bone tumors. Orthopade. 1995; Feb;24(1):2-14. 6. Puri A, Agarwal MG, Shah M, Jambhekar NA, Anchan C, Behle S. Giant Cell Tumor of Bone in Children and Adolescents. J Pediatr Orthop. 2007 Sep;27(6):635-9. 7. Saikia KC, Bhattacharyya TD, Bhuyan SK, Bordoloi B, Durgia B, Ahmed F. Local recurrences after curettage and cementing in long bone giant cell tumor. IJO 2011;Vol : 45, Issue : 2, 168-73. 8. Prosser H, Baloch KG, Tillman RM, Carter SR, Grimer RJ. Does curettage without adjuvant therapy provide low recurrence rates in giant-cell tumors of bone? CORR 2005;435:211-8. 9. Economopoulos K, Barker L, Beauchamp C, Claridge R. Reconstruction of the Distal Tibia with Porous Tantalum Spacer after Resection for Giant Cell Tumor. CORR 2010 ; 468:1697–1701. 10. Marcove RC, Weis LD, Vaghaiwalla MR, Pearson R. Cryosurgery in the treatment of giant cell tumors of bone: a report of 52 consecutive cases. CORR 1978;134: 275- 89. 11. Pikor TD, Kyte RD. Evaluation of peri-articular aggressive benign bone tumours treated with cementation and a locked plate. SA orthop. j. 2011; 10(2):48-55. 12. Chen TH, Su YP, Chen WM. Giant cell tumors of the knee : Subchondral bone integrity affects the outcome. Int Orthop 2005;29:30-4. 13. Ward WG, Sr, Li G. 3rd Customized treatment algorithm for giant cell tumor of bone: Report of a series. CORR 2002;397:259–70. 14. Hegde AS, Shenoy RM, Rai MP. 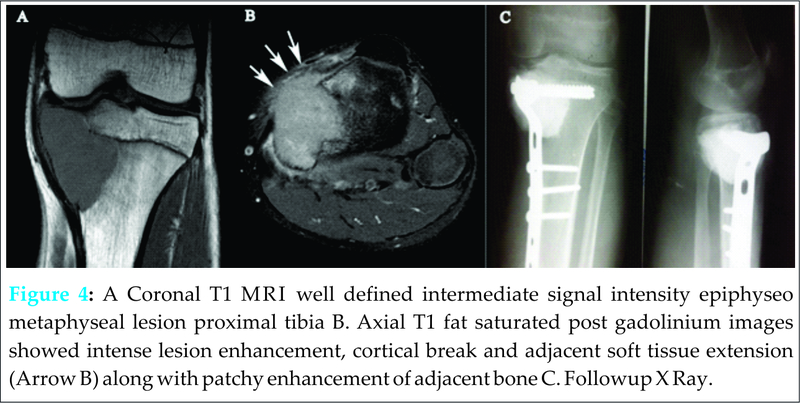 Giant cell tumour of the distal humerus: a case report Journal of Orthopaedic Surgery 2014;22(3):427-9. 15. Rock MG, Pritchard DJ, Unni KK. Metastases from histologically benign giant-cell tumor of bone. J BJS[Am] 1984;66:269-74. 16. Vult von Steyern F, Bauer HC, Trovik C, Kivioja A, Bergh P, Holmberg Jörgensen P, Follerås G, Rydholm A. Treatment of local recurrences of giant cell tumour in long bones after curettage and cementing. A Scandinavian Sarcoma Group study. JBJS[Br] 2006;88(4):531- 35. 17. Dridi M, Ben SS, M’Barek M, Trabelsi M. Metatarsal Giant cell tumour in a 7-year- old child : A case report. Acta Orthop Belg. 2011;77(6):843-46.